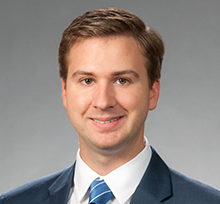 Samuel A. Moniz is an associate in Brown Rudnick’s Commercial Litigation Group. Prior to joining Brown Rudnick, Samuel served as a Research Assistant to Professor Adam Winkler at the UCLA Law Library. In this role, he researched a variety of issues to constitutional law and assisted in the preparation of a book on the constitutional rights of corporate entities. While at UCLA School of Law, he also worked as a researcher for Professor Steven Bank, focusing on corporate law. He was an active participant in Moot Court.